Over the past couple of weeks, I’ve been playing a ton of Smash Bros. Ultimate, and throughout this time I’ve been mulling the multiplayer changes they’ve made. I have not played the game online, which I know has been a source of frustration and controversy for many, so I’m not going to go into that aspect of the game. The game feels very well balanced, though that is naturally subject to change as patches come out and players get better. It’s not perfect, and I wouldn’t expect a game with 70+ characters to ever be 100% balanced, but Ultimate is in a good place for the time being. There are a number of factors that contribute to this feeling, but the overarching philosophy I sense from the game is based on three factors: 1) rounding out characters’ tool kits so no one option is too weak and no one option is too strong 2) providing universal mechanics that benefit all 3) making characters’ strengths on paper actual strengths. In Smash Bros. for Wii U (aka Smash 4), many characters ended up having a few extremely effective attacks that would render entire other parts of their movesets nearly obsolete. Think about Donkey Kong’s cargo up throw into up air (aka the Ding Dong) or Meta Knight’s dash attack/dash grab into up air strings. The game often focused on each character’s few powerful options, and it made you wonder why certain attacks even existed. In Ultimate, however, it feels like the craziest and most overwhelming attacks have been shaved down a bit while the neglected moves were given some love. Take Mewtwo, for instance. In Smash 4, Mewtwo’s down tilt was one of the best moves in the game, period. It had long range, it was very fast for how much ground it covered, and it started combos and juggles with the greatest of ease. In contrast, Mewtwo’s forward tilt didn’t see much use. Almost anything forward tilt did, down tilt did better, except for maybe hitting opponents who are jumping. In Ultimate, down tilt is still fast and with excellent range, but you can only reliably combo off of it if you hit with the base of Mewtwo’s tail, which means having to be closer to the opponent and thus being in a riskier position. The move is good, but it’s no longer a cure-all. Forward tilt, in turn, now has utility that down tilt doesn’t—namely better knockback, more kill power, and slightly more range. So players have reasons to use both. You might want to down tilt, but if the opponent’s at max range, forward tilt could be better for knocking them farther off the stage. You’ll see this across multiple characters’ movesets. Players will need to master their characters’ entire set of moves to do well. One of the biggest jokes of Smash 4 was that Jigglypuff, a character who specializes in aerial combat, took a much longer time to actually get off the ground than most other characters. Actually, the biggest joke was that Jigglypuff never got a single buff across the game’s many patches, but that’s a whole other rabbit hole. In every Smash game, characters take a bit of time to leave the ground after a player hits jump: this is called a “jump squat.” In Smash 4, the fastest jump squats were 4 frames (1/15 of a second), the slowest (Bowser) was 8 frames (2/15 of a second), and Jigglypuff was in the middle at 6 frames (1/10 of a second). If you’re confused by all the numbers, just think about it like this: because characters like Jigglypuff and Bowser took longer to actually jump, it meant that they would fail to land attacks that other characters could get away with. In Ultimate, every character has the same jump squat: 3 frames, or 1/20 of a second. This means that big, lumbering characters can’t just get trapped on the ground and be forced to eat hits because they’re busy trying to jump. This means Jigglypuff can take to the skies much more easily. Most importantly, it proportionally buffs characters who used to have bad jump squats much more than those who already had them. Going from 4 frames to 3 frames is a 25% improvement. Going from 8 frames to 4 frames is a 50% improvement. Big characters have for the most part been disadvantaged in the Smash games. 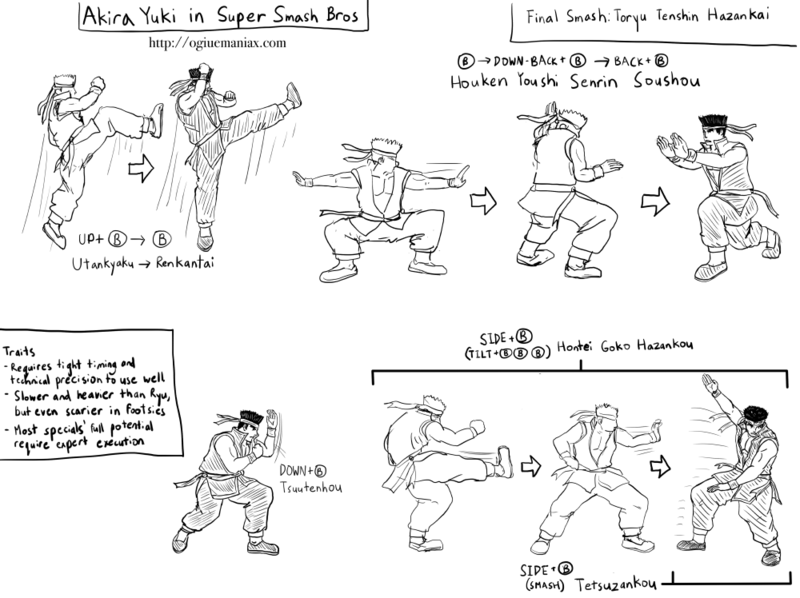 Bad jump squats, as mentioned above, are one factor, but the supposed weight advantage that would let such characters survive longer compared to their lighter adversaries never actually panned out in practice. Instead, these super heavyweights often ended up as huge punching bags unable to properly deal with the speedy attacks of their foes. Another supposed advantage that failed to live up to its potential is the tether grab. Instead of using hands, tether grabs utilized ranged weapons to grab from a distance—think Link’s hookshot or Samus’s grappling beam. The trade-off, on paper, is that these tether grabs are slower to make up for their longer range, but almost without fail they were simply worse than having regular, close-range grabs. Players could learn to use tether grabs effectively, but that was more about them making up for their characters’ flaws through intelligence and cunning. Both the super heavyweight archetype and the tether grab have new purpose in Ultimate, and it has largely to do with making sure these aspects actually matter. Big characters are heavier than ever and hit harder than ever, and it makes a significant difference in terms of how long they survive. Now, a King Dedede or a Ganondorf can reliably live long enough to become scary, especially when factoring in the “rage” mechanic that allows characters to hit opponents harder when they themselves have taken more damage. Grabs are generally worse in Ultimate compared to Smash 4, as characters have shorter range and take longer to recover from missed grabs, but the big exception is that tether grabs have been improved all around. Even if they stayed the same as they were in Smash 4, the gap between non-tethers and tethers would have been closer, but a lot of those tethers have either improved startup time, improved recovery, or both. The biggest winner here is actually Pac-Man, whose ranged grab in Smash 4 was literally the worst grab in Smash history due to its wonky collision detection and its poor overall speed. I thought Smash 4 was a really good game, even in the last couple of years as Cloud and Bayonetta began their rise and their stuffing of the lower tiers. History could repeat itself, but based on the changes mentioned, I think there’s a strong chance they’ve learned from their mistakes. Balancing a competitive game is a tremendously difficult endeavor, but I think the Smash Bros. Ultimate development team is up to the task. For the past month or so, much of the online Smash Community was consumed by the so-called “Grinch Leak,” whose promises of revealing new characters dominated conversation. Then the November 1 Smash Bros Nintendo Direct revealed the last tidbits of information before launch (new playable characters, DLC on the way, a story mode, etc. ), dashing the hopes of many of the leak’s believers. Given the sadness and rage expressed by those who trusted the leak, it makes me wonder about why people continue to set themselves up for disappointment through following Smash leaks, and the only answer I can think of is that they consider it worthwhile. In a way, researching leaks and getting invested in them is almost a form of emotional gambling. I understand that people are different when it comes to spoilers—some even readily welcome them. But the Grinch Leak interacted with the Smash community in an odd way that goes beyond just knowing something in advance. First, it came at a time when some fans felt starved for information, despite Isabelle from Animal Crossing being announced less than two months ago. It was as if people were so desperate for news that they’d glom onto anything convincing, and to spice it up, the Grinch Leak dropped a bunch of “reveals” for characters with very vocal and loyal fanbases. It’s not just that people thought the leak to be believable—many clearly wanted to believe. And then the Direct hit, and the characters shown were not what Grinch supporters were expecting. In came the comments. “How could the final Smash Direct be this anticlimactic? Ken? Incineroar?! PIRANHA PLANT??! !” The Smash community has always had problems with getting excessively overhyped, and this was no exception. But I also wonder about the way fans seem to actively trying to to hit these dramatic emotional highs at the possible risk of plummeting into equally drastic lows. After all, one doesn’t necessarily need to pay attention to these leaks, and one can simply hope for their favorite character to be added to the roster without the additional backup of some “inside scoop.” That’s what makes it feel akin to gambling, albeit a much safer, cost-free form. There’s a risk and a payoff for wanting to believe. It also reminds me of how popular conspiracy theories can be. “Some employee leaked information about a game that’s not out yet” is nowhere close to “the United States government faked the moon landing,” but there is a similar idea at play here: there’s inside information they don’t want you to know about, and by having the real info, you have the edge over the others. And much like conspiracy theories, the fact that some leaks actually turn out to be true only adds fuel to the fire. In a certain sense, following leaks and getting into arguments over them is another form of community interaction, and it’s largely harmless fun. Even so, because of how they monopolized the Smash community’s general consciousness, I do have to wonder if there might be a better use of people’s time and emotional energy. E3 2018’s come and gone, leaving in our wake the juiciest details about the new Super Smash Bros. Ultimate for the Nintendo Switch. The goal is clear: to make this the most complete Smash game ever, most evident in the fact that every playable character across the franchise’s almost 20-year history is back, along with newcomers Daisy and Ridley. I have a million thoughts about the new game, in no small part due to the sheer amount of information coming our way. Not only were there 25 minutes devoted to Ultimate in the Nintendo Direct, and plenty of Nintendo Treehouse play sessions at E3, but there are also official introductory video clips for every characters, filled with tidbits if you look carefully. My major takeaway from following all of this news is that Ultimate is embracing the idea that a game can truly be capable of excelling in both competitive and casual environments, instead of having one compromise the other. Many decisions made for the current build benefit players of all stripes. One brand-new change in Ultimate is that rolls and dodges get less effective if you overuse them. While I personally believe that their power in Smash Bros. for Wii U is quite manageable for the most part, there is an environment where rolls are the bane of everyone’s existence: wi-fi play. Thanks to the inherent lag in online play combined with the fact that players had no control over who they connected to, rolling became much, much more powerful. For Glory mode became infamous early on for being filled with players who roll over and over, relying heavily on the inconsistency of variable online connections. But while highly skilled players, especially the pros, have mastered punishing bad rolls, it’s not as if they fail to benefit from having dodge maneuvers being limited by decay. Playing at the higher levels means having a thorough mastery of all aspects of the game, and now rolls and dodges have an added wrinkle to them that encourages players to use their other fundamental tools, like walking and running. Moreover, these evasive techniques are now a resource to be managed. Do you use more rolls now to guarantee getting out of a sticky situation if it makes you more vulnerable later? Tournament players now have another skill they can improve, and newer players online can avoid frustration dealing with lag. It’s win-win. In the history of Smash Bros., there have been two different types of air dodges. The first is the directional air dodge, originally from Super Smash Bros. Melee, which allows players to become invincible for a brief period and move a short distance more in any direction they choose. The penalty is that you become unable to do anything but plummet down afterwards, leaving you vulnerable. The second type is the unlimited air dodge from Super Smash Bros. Brawl, which lets players use repeated air dodges but prevents them being able to do a quick juke like the Melee directional air dodge does. Air dodging in Ultimate is a hybrid version between Melee and Brawl. Players can choose to shift their direction during an air dodge or fall naturally, but there’s a period during which follow-up actions are impossible. It doesn’t put you in a helpless state as it would in Melee, but only one air dodge is possible before landing. The air dodge in Brawl was changed in the first place likely so that it would be easier to use and understand for newer players—especially Nintendo Wii owners who were playing video games for the first time. It even introduced the concept of dodging in the air and counterattacking, something that wasn’t possible in Melee. Certain characters, namely Mewtwo in Smash for Wii U, even excelled at this strategy. However, fans who love Melee competitively often dislike this air dodge because it means juggles and combos were easier to escape. In their eyes, being able to air dodge repeatedly took away from one of them franchise’s best features. Ultimate‘s air dodges leave a player vulnerable but not overly so. Using it eats up an option and makes one more susceptible to getting juggled, but the player can still attack out of it. Reports say the stationary air dodge allows faster recovery, which means the Mewtwos of the world can still do their thing. Directional air dodging vs. stationary air dodging also provides an added layer of decision-making, and gives characters like Yoshi and Little Mac who traditionally have suffered from limited recovery options to do a bit more. One of the other new features of Ultimate is the ability to do pretty much anything immediately out of an initial dash. Past games restricted your options, but now everything from smash attacks to tilts to specials and more can happen out of a dash. The probable reason this was previously not possible was because it made dashing into more of a commitment, and players ideally worked around it. In practice, newer players tend to just charge headfirst into things and then complain when their predicable option gets called out. Melee is something of an exception to the rule of restrictive dashes because of the existence of wavedashing, an advanced technique that allows characters to slide while standing still, granting greater access to their arsenals while advancing or retreating. The lack of wavedashing in other games is a huge sticking point for many Melee fans, and is part of why they prefer those other games less. However, the execution of a wavedash requires a good amount of timing and dexterity. While most Melee players will claim it’s simple and easy, for many people it’s not, and failing to learn it actually significantly impacts your ability to succeed in that game. By having these “dash cancels” (or whatever they’ll be called) come out of a more natural tendency to run ahead, it potentially makes less experienced players feel like they have more control. At the same time, it also fulfills at least some of the functions of wavedashing while being a more simplified command. Just dash, pause briefly, and attack. Balance for a test version is of course not finalized, but from all reports so far it’s clear thay they’ve aimed for competitive improvements to nearly every character. Zelda suffered from being unable to act out of her Din’s Fire and Farore’s Wind special moves in past games, but now they no longer hold her back. Ryu always faces his opponents 1v1 (just like in Street Fighter) and can now back dash to improve his footsies. Little Mac can use both of his recovery moves, allowing him a little more leeway getting back on stage. Ganondorf’s attacks are surprisingly quick. The only exceptions seem to be Fox, Cloud, and Bayonetta, who are more limited in what they can do. Notably, Bayonetta’s infamous combo game and Witch Time ability have been made less effective, and Cloud’s Limit, which granted him improved specs as well as access to souped up specials, now only lasts 15 seconds instead of being potentially infinite. Characters are getting quality-of-life changes and things specifically targeting their crippling flaws in previous games while also making them easier to use. There’s a clear desire to bring everyone up. However, what’s also important is that it shows on some level an acknowledgement of the skill found among stronger Smash players. Likely the reason Zelda’s Din’s Fire caused a helpless state when performed in the air was a fear that using it offstage, especially against weaker players, would be too powerful. No more—now, the game acknowledges that it might be really strong in those scenarios, but so what? “You can handle it,” says Ultimate. Despite being a mere test build, praise for the gameplay has thus far been near-universal—something that didn’t happen with Smash Bros. for Wii U when it was revealed in 2014. Super Smash Bros. Ultimate appears to be on track to giving almost all players what they want, and it’s thanks to mechanics that seem to reward skill without making the learning process daunting for less strong players. Unless something goes terribly wrong between now and the December 7 release date, it might become the most successful Smash game ever, both financially and competitively. For more details, as well as some of the sources I used to get info for this post, check out the following.